First, I ought to clarify that this review is about Kristina Grozeva and Petar Valchanov’s The Lesson, not Ruth Platt’s The Lesson. I saw both in close proximity, and Platt’s film really did not cut it for me (so I'll say no more about it). Grozeva and Valchanov’s film, on the other hand, is a meticulously constructed tale. I have not felt so frustrated for a lead protagonist since watching Oliver Stone’s U-Turn (1997). As with Stone’s movie – and this is the only salient point of comparison – The Lesson’s central protagonist faces a n unrelenting series of misfortunes. Individually, most of the mishaps are relatively minor, but cumulatively they are torturous: I spent most of the film desperately yearning for one of the protagonist’s efforts to pay off. I will not reveal whether she ultimately succeeds or not (as that would spoil the “fun”). However, I will say that while the climax is somewhat outlandish, the final scene is an understated black comic masterstroke: not only did it make the slightly implausible precursor palatable, but it also offered a neat reward for making it through two excruciating hours of escalating calamities. The performances and cinematography are restrained, and that only adds to the film’s constricted atmosphere. 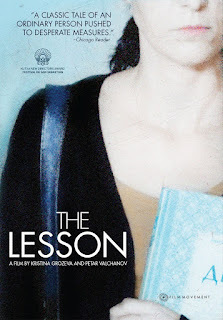 Recommended, but only for those willing to hold their nerve for the movie's wry "lesson".